Expanded knowledge about the pathophysiologic effects of severe in- juries, advancements in the intensive care of victims of multiple injuries, and the treatment made possible by modem cardiovascular surgery make it appear sensible to combine the assessment and therapy of thoracic injuries into a synthesis of various branches of medicine. 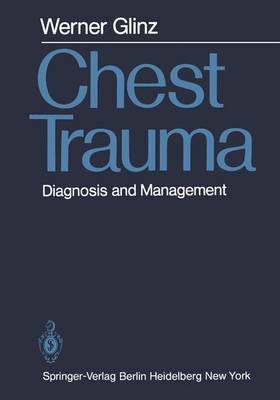 This monograph, therefore, is intended not only for the specialist in thoracic or cardiac surgery but also primarily for the person who is the first to be confronted by thoracic injuries, namely, the general surgeon or the traumatologist. It reflects my own personal experience as chief surgeon of an emer- gency surgery ward of a university hospital and as head of an inten- sive care unit for the severely wounded, which treats well over 100 patients with severe thoracic injuries annually, and is based on an analysis of these cases. My experience as a military surgeon in Vietnam was also taken into consideration. Many wounds in the area of the thorax can be successfully treated with simple, conservative procedures, though by "conservative" I do not mean to imply "inactive." An aggressive conservatism is need- ed, which must pay attention to small details. In given cases, how- ever, it requires the quick decision-making capability of the com- petent surgeon. For this reason, considerable space is devoted to questions of evaluation and practical procedures.